OOH, look, I am getting carried away with my themes here. I am using two themes in one post! Is that even legal? Well, this is my blog so we play by my rules here! 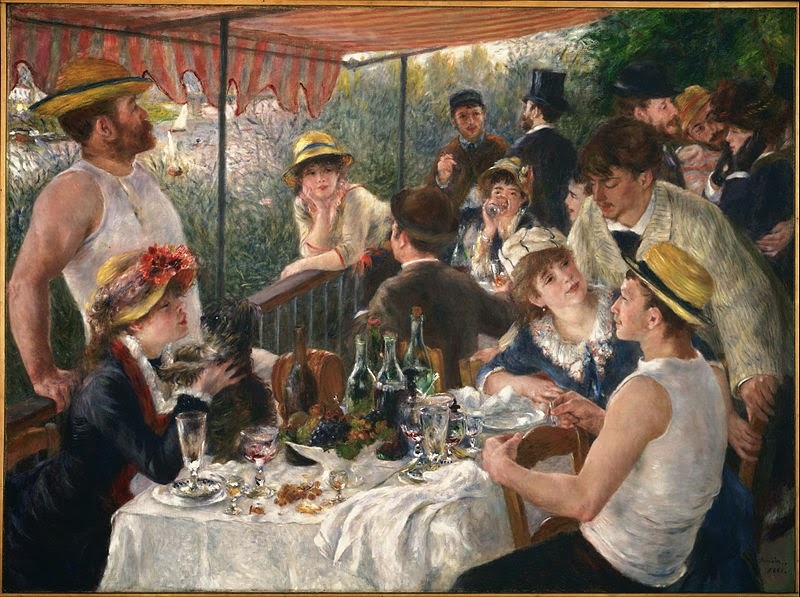 Here's a picture by Auguste Renoir, Luncheon of the Boating Party, 1875. He is really my favorite artist which annoys me since he was an anti-semite. Luckily, I can admire his work without him knowing and I am not supporting his career since a) I can't afford his artwork and b) well, he's dead. So I have overlooked the fact that he was a jerk and just focus on his art. One of the best parts of going to France was seeing so much of his art at the Musee D'Orsay (also, the food). I did not see this painting there though since it's in Washington DC. Go figure. I do have this print in my home though. I reframed it the other day and it reminded me of the last post about anthropomorphizing. I like the painting because it looks like a story. The more closely you look at it, the more you can imagine this scene happening. Actually, when I looked for it on wikipedia, it gave an explanation of who each of the people are. I thought it was more fun to look at it without knowing who they all are though so I will post the list at the end. This is the upper right side corner. What is happening here? She is being manhandled and spoken to inapproporiately? I can't imagine what he is saying because I can't think of the last time I didn't want to listen to someone so much that I literally held my ears closed. I mean, I can think of wanting to but this classy looking lady is actually doing it! That is so cool! Look at all the people in this picture and here's a lady ignoring all of them and talking to her dog. I've totally been to parties like that. I can almost hear her saying "Who's a good boy?" 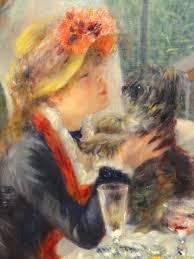 Sidenote, according to the notes on this painting, that woman is Renoir's future wife. Don't know if that was his future dog. The seamstress Aline Charigot, holding a dog, sits near the bottom left of the composition. Renoir later married her. Actress Ellen Andrée drinks from a glass in the center of the composition. Seated across from her is Baron Raoul Barbier. Also wearing boaters are figures appearing to be Renoir's close friends Eugène Pierre Lestringez and Paul Lhote, himself an artist. 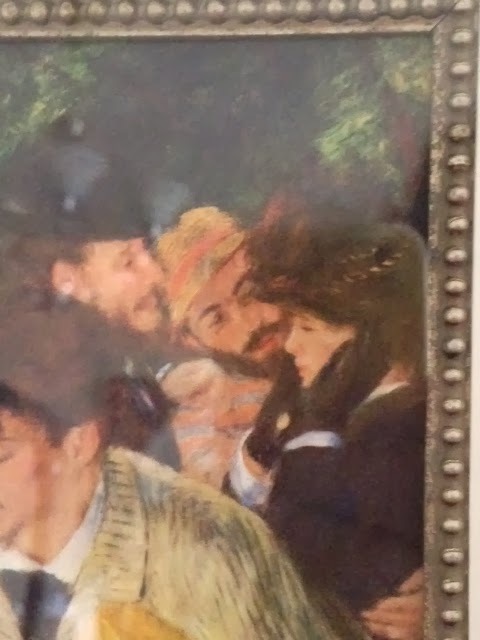 Renoir depicts them flirting with the actress Jeanne Samary in the upper righthand corner of the painting. In the right foreground, Gustave Caillebotte wears a white boater's shirt and flat-topped straw boater's hat as he sits backwards in his chair next to actress Angèle Legault and journalist Adrien Maggiolo. An art patron, painter, and important figure in the impressionist circle, Caillebotte was also an avid boatman and drew on that subject for several works. It almost reminds me of how people tag their friends on Facebook pictures today. I suppose there is really nothing new under the sun.